There were no filing deadlines which passed this past week. Next Friday (April 30), Congressional filing closes in Florida and Georgia. From there, Michigan’s deadline is May 11. Near the end of next month, filing then closes in rapid succession in Connecticut (May 25), Arizona (May 26), Colorado (May 27), and Wyoming (May 28). At the time this article is being written, filing has closed in 28 states. This means that we know who the Congressional candidates are in 264 (out of 435) House races and in 18 (out of 36) Senate races. We also know that in 22 House seats (19 Democratic held and 3 Republican held), the Democratic or Republican candidate escaped major party opposition. There have been no formal retirement announcements since the Bart Stupak (D-Michigan) announcement two weeks ago, although recently there have been rumors that Michael Arcuri (D-New York) may be considering retirement. His upstate New York district is one of several Republican leaning districts whose capture by the Democrats in 2006 enabled them to take control of the House. Obama carried this Republican leaning district 50-48% in 2008, but despite the strong Democratic tide that year, Rep. Arcuri was re-elected with a tepid 52% of the vote. Since that election, Arcuri himself has had a mixed voting record. While he supported the stimulus and voted “Yes” on the original version of healthcare reform last fall, he also voted “No” on “cap and trade”, as well as the version of healthcare reform which was recently signed into law. It is this mixed voting record that has attracted strong GOP opposition (in fact, one of his Republican challengers has outraised him), as well as the determined opposition of the Working Families Party. While this liberal political group once supported Rep. Arcuri in his 2006 and 2008 victories, they’re now threatening to support a primary opponent. Fortunately for the incumbent, New York’s July 15 filing deadline gives him plenty of time to assess his options. So far, only Illinois and Texas have held primaries. However, primary/special election season is fast approaching. 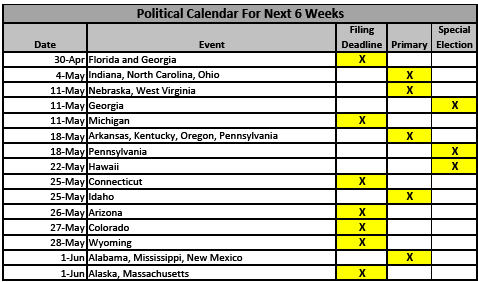 Over the next six weeks, there will be 13 primaries and 3 special Congressional elections (in addition to the 9 filing deadlines within that same period) . Therefore, we are attaching a calendar of elections/filing deadlines below so you can keep track of the numerous races. From this list, there are several races we are currently focused on. 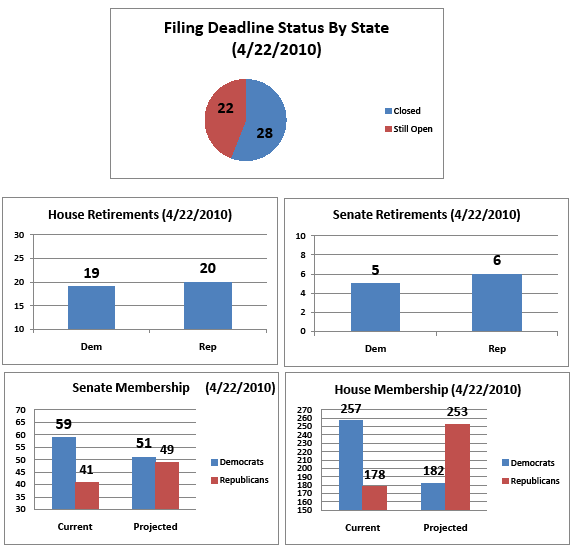 For the upcoming filing deadlines, though 85 House members (49 Democrats and 36 Republicans) have yet to declare their electoral intentions, we are most interested in the Florida Senate race (April 30 filing deadline), as incumbent Republican Governor Charlie Crist is trailing badly in this race. Governor Crist was damaged politically by his embrace of President Obama during a visit to Florida last year, and his support of the stimulus didn’t help. With Republican Presidential candidates lining up now to support his Cuban-American (and more conservative) opponent, the question is whether Governor Crist will (1) switch back to the Governor’s race, (2) drop out of the Senate race, or (3) remain in the Senate race, but run as an Independent. Though the third party route is a viable option, Republican donors and campaign staffers have vowed not to support this course of action, as it would create a three way race which a Democrat could win with less than 50% of the vote. The 13 primaries which will be held over the next six weeks starting on May 4 are also worth watching, as the Arkansas, Kentucky, and Pennsylvania primaries involve ideological dogfights where more ideologically pure candidates of both parties (Republican in Kentucky; Democrat in Arkansas and Pennsylvania) running against more establishment oriented candidates. The outcome of those races will be an interesting gauge of the strength of ideologues within either party. The special elections held will be a good interim test of Democratic voter intensity. The May 18 special election in rural/blue collar southwestern Pennsylvania to replace the late John Murtha (D-Pennsylvania) in a 49% McCain (but 51% John Kerry) district will be the first test. The Republican candidate is ahead 44-41% in a recent poll. This same poll also shows 28% support for healthcare reform and 33% approval for President Obama in the district. Even though the poll numbers show a close race, the underlying dissatisfaction with the President has likely forced the Democrat both to deny his liberalism and state his opposition to healthcare reform. However, not all is lost for the Democrat. He is helped by the fact that contested statewide Democratic primaries held on the same day as the special election will bring proportionately more Democrats to the polls. This is the sort of swing seat Republicans need to win if they want to have big gains this fall. Over in Hawaii, a “winner take all” race on May 22 shows the Republican with a narrow 32% lead in the polls in a three way race against two Democratic opponents (who are polling at 28 and 27%, respectively). One of the Democratic opponents is a white male who is supported by the Washington Democratic political establishment (and who once represented Hawaii’s other Congressional district for several years), while the other Democrat is an Asian-American woman who has the staunch support of the Hawaii Democratic establishment. Though pundits think a GOP victory would be reversed in the fall elections (when the Republican would face a single Democratic opponent), the congressional district is actually the more Republican of the two districts in Hawaii, and in fact elected a female Republican in 1986 and 1988 who, coincidentally, was the beneficiary of Democratic infighting in her first race.